Reasons for not holding the baroque bow at the frog. Playing the treble viol and the violin, I came to notice an interesting fact. There wouldn’t be any musical reasons not holding the (baroque) violin bow at the frog. In the late Renaissance period, people use the same bow for violins and treble viols. 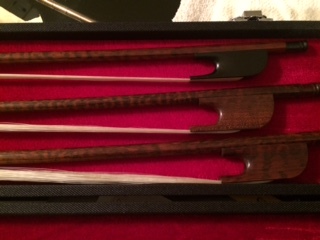 I guess violinists might use the bow which treble violists played. As you know, violist does not hold the bow at the frog; they hold the root part of the bow. So the hairs of a root part are usually a little oily and dirty by the violist hand. There was no choice for violinists to hold the frog because the violinist could not make any sound at a root part. In modern days, the viol has its professional players and the violin has the same. Therefore, it is hard to imagine such confused situation might happen. I think it could happen. Play Along CD and AdMaestro, the best combination. I had played with Play- Along CD sometime and I had even sold CDs of Minus One Company in my sheet music shop before I started to develop AdMaeestro. Generally speaking, the satisfaction from Play Along CDs is much less than that of Karaoke. I think the reason is simple that the performance of classical music is based on a long tradition and soloists are not get used to follow orchestra. On the contrary, Karaoke is a new field of music and its preposition is to make singers follow CDs. The best way to use Play-Along CDs is to use them as a source of AdMaetro’s conducting data. As AdMaestro can change the tempo of CDs freely, so the essential problem of soloists disappears. I have already rehearsed piano concerts of Mozart, Chopin and Schumann. But it was not easy to satisfy pianists for various reasons. First, we needed good speakers with 50-100W output to balance out the volume of pianists. It is because they tend to play louder when they play concerts. Next problem was the pianissimo of orchestra, its volume came down so low and pianists could not hear well. So, I put a set of monitor speaker besides the pianist. There were more problems. By the sound of speakers, we can acknowledge the first violins on the left and cellos on the right, but cannot tell exactly where they are. As we experience daily, we can distinguish the voice of a certain person much better if we know where he is. The same happens during the ensemble, It is a great help for the soloist to know exactly where other players are located. I put small string orchestra, one pult each, in front of speakers. Things are greatly improved. I am going to join a concert of elementary school girls on this March 3. One of them will play 3rd movement of Mendelssohn’s Violin concerto with a small string orchestra and AdMaestro accompanied. She is not specially trained to become a professional violinist, so her tempo is slow and volume is small. This will be the first stage experience for AdMaestro. Will keep you informed. I would like to explain about a history of 415Party. I like to play early music for many years, and I have used modern instruments with satisfaction for long years. I happened to have an interest in period instruments in the spring of 2009. It started from Viols. I wanted know why viols are once disappeared from musical scene. I read some books but none of them make me really understand, so I bought 2 trebles, 1 tenor and 2 bass viols to find my answer. I asked my friends to play viols and we start enjoying viol consort in about 3 months. Playing late renaissance songs by viol is easy as they have frets if you have some music background. We use late renaissance vocal music like madrigals and chansons. And it was enjoyable for the time being. However, we found it a little boring and also we feel something is missing. We added 2 recorders, crumhorns and a drum. Then we found we definitely need vocal. I brought in Soprano, Alto, Tenor and Bass. Soprano was opera singer but all of them are amateur singer in view of Renaissance music. We all satisfied the nice group once but we immediately acknowledged that we do not have a lute player. They asked me to play the lute. About one year past, we had a pleasant renaissance music concert with all of us having the experience less than a year. After this concert we came back to viol consort music by Dawland, Simpson, etc. During the process to achieve the renaissance music group, I fell I found my approach to early music. I did not invite professionals for any instruments. Reason is that musicians in those days are usually multi-players and even in Rome, Venezia or Firenze it would be impossible to have a concert with high level professionals like now. And we found a great fact that very amateur vocals and very amateur viol players help each other beautifully. For singers, it is really difficult to sing late renaissance madrigals in good tune. For viol players, beautiful voices are good compensation for their small and poor tones. I remember that I really had tough time to practice and play the lute for 2 month. First, I thought people would not hear my lute well because the volume is small, but it was wrong. In the circumstances of renaissance ensemble, Lute is only one plucked instrument and the audience can distinguish its tone easily. While we are enjoying consort music, one of my friends asked me to do “415Party” that is for early music of baroque era and it has got started with our basic rules inherited from our experiences of renaissance music that are respect the style of the day and enjoy the fun to be multi-player if needed. 415Party is open to everyone. It is held by 7 to 8 players for recorder, traverse, baroque oboe, baroque fagotto, violin, viola, cello, viol, cembalo from 13:00 to late evening. What about Viols? I will report you probably next time. I have studied Haydn’s String quartets Op.20 which are composed in1772, for the strength and expression marks. Mozart composed his 13 early quartets around 1772. Music source is HN9208 by Henle Verlag. I was surprised at the variety of expression marks by Haydn himself that I thought many of them, like ff, poco forte, are by editors of posterity. 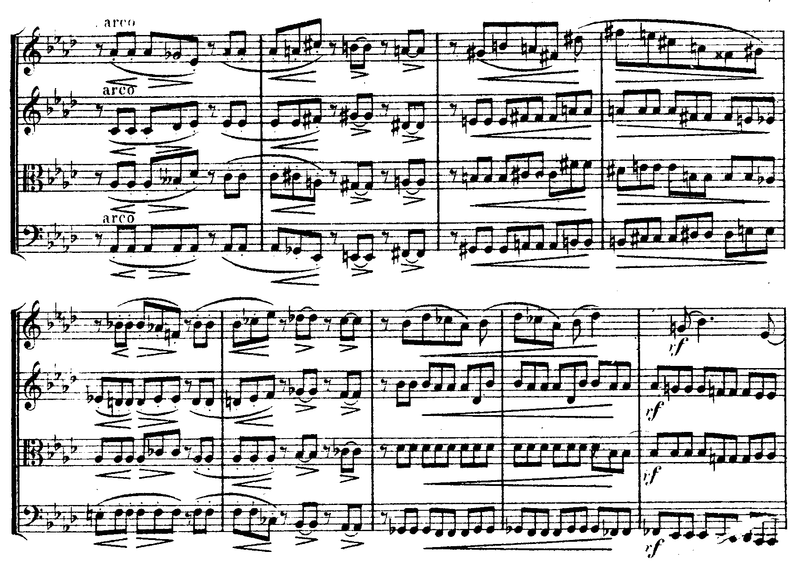 I feel like those detailed indications show the strong interest and fondness of Haydn for String Quartet because Haydn established a new style of string quartets by this Op.20. Haydn String Quartet Es-dur 20-1 ff, f, p, rinf, fz mezza voce, pianiss. How many rehearsals do you need for a good concert? We held a concert in Kawaguchi City Hatogaya civic center in the following program. Many of our members are always busy, so practice schedules are our chronic problem. However, we have achieved 49th periodical concert in about 5 years. Being a group of average amateurs, we have devised a unique way of practice to do many concerts..
For example, we only had 2 rehearsals for Handel, Vivaldi and Dvorak. Mozart was only once. As there are audiences who always come to our concert, so we should keep good quality. We had a little bitter experience with low-quality performance in the past. We found 2 tips. First, make your members understand that chamber music is a collection of solo. And if the quality of the parts is bad, the whole is never good. So, I recommend members to play together regardless the form of ensemble whenever they are available. It a bit strange to play quintet by 3 people, but there are many things to do if the object is to improve individual’s quality. I also know that it is very hard and boring to practice inner voices and quality of ensemble really depends on them. If your group has done my suggestion, you would agree that two rehearsals will do even for amateur groups, and what’s more, all of members will be well prepared as there are only two rehearsals. We practiced the first quartet by Brahmas today. When I was unable to attend this quartet group last time, they practiced this work by 2nd violin, viola, and cello. Maybe because of their effort, we have successfully played this work from 1st movement to 4th movement without any trouble in ensemble. For amateur quartets, Brahms No.1 is quite tough to play since it has several difficult points to play together. I would like to pick up some and offer you clues to enjoy playing. The problem is cross rhythms between Cello and 2nd Violin. First and biggest problem may be a decision to practice this part by 2nd Violin and Cello. It looks a good and natural idea. If you use Metronome may be much better. I do not agree with this method because it eventually forces the first violin to follow 2nd Violin and cello which are not playing melody. So, how to practice this part? First violin and cello should practice to play snugly. Then, 2nd violin and viola join. This is quite simple and ordinary way. Here 2nd violin is just playing compensation rhythm.When a trouble occurs during the performance, 1st violin just look at cello and play with his rhythm, then you can avoid a break up. In the actual performance, the most difficult part is the beginning. Cello has a clue. Cello must have a good spirit of soloist here, and he or she should play with maximum confidence to play this simple piano passage. And first violin has to pick up the tempo of cello and put his note on the 4th eighth note of cello. I know that it is very difficult in the stage performance for various conditions of the stage. But we should try this to be a good quartet. The below is famous for its difficulty. I think this portion may be one of the most difficult parts of all the quartets in classical and romantic area. Confusing thing in the confusing part is that more you have a good sense of harmony; more you get into a trouble. If you play your melody comfortable on cello’s GisGisGis/AAA/HHH/CisCisCis. All wrong. You should play your melody on GisGis/GisAA/AHH/HCisCis/Cis. I remember that I practiced this passage for my pride in the past. What I did is that I played the cello part with piano and recorded it. And I practiced until I fully satisfied with the result. When I achieved, I came to find the real and a bit strange beauty of this passage. This string quartet requires a lots of ensemble technique based on the firm sense of rhythm and one of the best quartet to improve your quartet. Please challenge this beautiful work. As a good player, everyone should know what kind of expression marks the composed used. I made a list of the strength and expression marks of String Quartets by Mozart. His notation is quite common for the early 13 quartets, but they became very complicated from K.387 "Spring" quartet in view of the common standard of his time. In General, Mozart's interests are focused on the area of the expression in middle volume tones rather than extending the total volume to fff or ppp .Especially marks like sf, fp mfp acting on one single note are frequently and carefully used after "Spring" quartet K.387, To interpret these marks finely will be the clue to understanding what Mozart requested in his music. Mozart String Quartet K.156 f, p, cresc. Mozart String Quartet K.157 f, p, cresc. Mozart String Quartet K.160 f, p, fp, cresc. Mozart String Quartet K.173 f, p, decresc. Mozart String Quartet K.387 f, p, sf, fp, pp, sfp , cresc, > calando, decresc. Mozart String Quartet k.428 ff, f, p, sfp, fp, cresc. decresc. ten. Mozart String Quartet K.465 f, mf, p, pp, sf, sfp, fp, cresc. Mozart String Quartet K.589 f, mf, p, sf, sfp, mfp sotto voce, cresc. Here is Mozart's only one decrescendo mark in his string quartets, it is in the first movement of K387 "Spring". Mozart first used decresc. in K428, and he did not use "dim." The below is ff that he used only once. It is written in the Menuetto of K.428 Es-dur. I feel like that he has no way to go to ff here. Next example is the last part of Adagio in the 1st movement of K.465 "Dissonance”. I would like you to check your score that sf in measure 18,then, sfp and last measure with fermata is fp. This part is one of the difficult parts to play together. So don't be relieved for just passing here safely,please develop your image and interpret the meaning of these marks. I think it important to discuss with your quartet members. 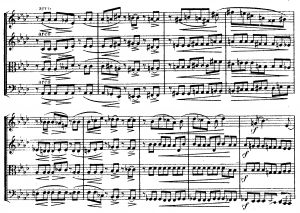 This is the last movement of d-moll K.421, Strength marks of measure 90 are complicated; sfp for Vn1, sf for Vn2, fp for Va and sf for Vc.You may feel what Mozart is trying to do, but you have to decide only one interpretation when you play. Therein lies the beauty of the musical interpretation. but differ in various ways. Here are the Dynamics and Expression Marks of Boccherini in the first Violin Part. AdMaestro in self-flattery, There are amazing effect. That's because playing admaestro is to become a conductor. Beethoven Symphony No. 3 "hero" is edited by one beat per measure. Everybody can begin this great work with delight., It is really easy.But after the main theme, there are some measures that has no sound as a first beat, You have to point the first beat to the orchestra . This is the beginning of trouble if you have not good sense of metrical sense. Don't worry. If you try several times consulting with a score, you will find yourself much improved in metrical sense. I have pressed down the Submit button of the Intel Dashboard today. My App is AdMaestro PC Version. The Challenge began last July for Idea Competition and I have selected one of the finalists in October, and Due date of the final submission is 15th February. My app is for conducting software named AdMaestro. Its basic feature is to change the tempo of commercial CDs by conducting gestures. You will feel New York Phil harmony is following you. Our latest version has speech commands to start playing and a gesture command to stop playing. Due to these simple commands, you can use AdMaestro in the actual rehearsals for string orchestras and choirs. I am very happy I could submit my offer; I will go to APA (Amateur Players Association tomorrow to enjoy Mozart, Reich and Haydn.